Get ready to hit the jackpot this April with Slots Million casino offering six brand new games from top developers to make sure their players are feeling great this Spring. NextGen's brand new five reel slot bring players along for the adventure in Gorilla Go Wild as Gary (the gorilla) as he searches the jungle far and wide for a place to build his future kingdom. This cute, cartoonish, and fun game gives players the chance to explore from ancient ruins to the treetops. Dragon's Myth is Rabcat's story of a fearless fiery haired heroine, who also serves as the game's Wild symbol, adventuring to encounter dragons of all sorts. The flying lizards swoop over the five reels as they spin, giving chances to take the Dragon's Bounty bonus and Free Spin mode. Microgaming contributes an amazing four games to the month's new releases. The first is Rabbit in the Hat which offers nine fixed pay lines across five reels and the chance to win up to 90,000 coins from the Mystery Hat. Wave your wand and conjure up Wild Hats, Cash Hats, and Free Spin Hats. Sit down at Harvey's for a five star restaurant experience with five reels and 25 pay lines. Pop the champagne cork and enjoy some escargot, among other high class symbols, as you watch for the restaurateur to make an appearance, bringing coins and Wilds right to your table. After dinner, get ready to dance the night away with Boogie Monsters, a five reel with 40 pay lines. Creatures of the night will be on the dance floor and helping you search the messy bedroom for Fat Bat's big bonuses. Wind down for the night with Microgaming's video slot machine take on a classic nursery rhyme in Georgie Porgie. With 15 pay lines across the five reels, this game makes for an exciting update with Scatters and Wilds popping up throughout the game. 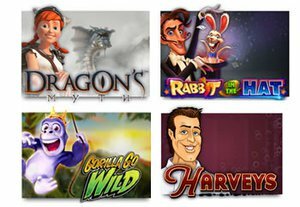 All six of these new games and more are available right now at Slots Million where players who register a new account are welcomed with up to $800 and 100 free spins for Gonzo's Quest: The Search For El Dorado.